For centuries, men have owned canes and walking sticks for necessity, prestige, protection or collecting. Now it is possible to own the finest, solid machined and tapered aluminum cane ever manufactured. It's unbelievably strong! We apply a unique clear anodized finish to solid 6061-T6 grade billet aluminum, one of the strongest aluminum grades available for machining. It's strength and design is impressive, to say the least. But it doesn't stop there. Well placed machine cut grooves on the upper and lower shaft provide a non-slip grip. 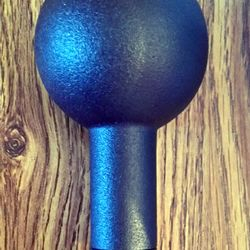 The solid aluminum Knob, C or T handle fits perfectly in the palm of your hand. The aluminum cane shaft tapers from 7/8 inch diameter from the upper shaft to 5/8 diameter inch at the tip. Our exclusive engineering and machining process for tapering the long, one piece solid billet shaft creates one of the strongest, most beautiful walking canes ever. These canes are solid. We do not extrude a cheap hollow tube to make our canes. 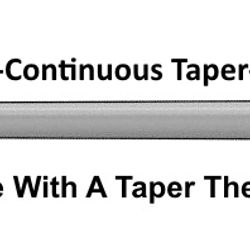 The taper is cut on a machine lathe the entire length of the shaft so the aluminum retains it's original strength and integrity. The cane comes with a heavy duty rubber slide on tip. Most standard cane tips will work for this cane if one prefers to change tips. We Do Not Cut Canes To Length. 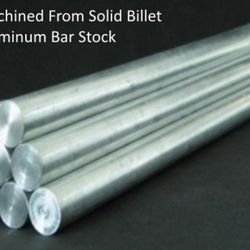 This aluminum cane can be cut to your preferred length. The cane is relatively easy to cut with a metal cutting saw. Make sure your cut is square so the end fits flush into the rubber tip. Only cut the tip end and not the handle end. NOTE: This cane is a Hand Made item. 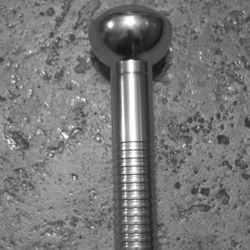 The shaft is machined and hand polished. The knob handle is machined and hand polished. The T handle and C handles are forged and hand polished. As with most hand made, hand polished items, please expect tiny mill and forge marks. They are nothing serious. All aluminum surfaces are anodized. Try One And You'll Immediately Appreciate The Quality And Feel The Security. And It's Guaranteed For Life! The cane is guaranteed for life against defects for the original owner, if the cane is reasonably cared for. Reasonable care means not abusing the cane and keeping the cane surface clean. This non-transferable warranty specifically excludes the rubber tip, loss, abuse, neglect, scratching, denting, common wear or misuse. 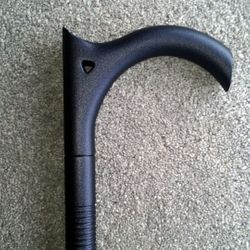 No one in the process of manufacturing, distributing or promoting the solid aluminum cane assumes any liability for improper use or improper ownership of the cane.